You are here: Home 2019 February Gardasil – buyer beware. Dr. Weeks’ Comment: Increasingly, scientists are very concerned with the gardasil vaccine. I was concerned and warned you years ago before 2014 – HERE and HERE and HERE . But now the evidence is damning…. Pre-vaccination period : spectacular success of cervical smear screening with a steady decrease in the rate of invasive cervical cancer. 11 to 7.1 in France. AUSTRALIA : contrary to the FAKE NEWS OF THE MEDIA AND POLITICS, REGISTER DOES NOT SHOW CANCERS OF THE CERVIX DISAPPEAR, BUT INCREASE. Australia was the first country to organize routine immunization for girls (April 2007 school-based program for females aged 12–13 years, July 2007 time-limited catch-up program targeting females aged 14–26 years) and then for boys (2013).. 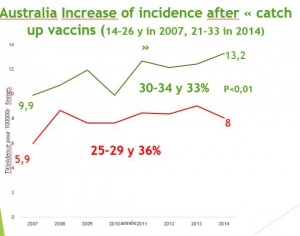 According to the last Australian Institute of Health and Welfare publication (2018 publication describing the detailed rates until 2014 )  , the standardized incidence in the overall population has not decreased since vaccination 7/100000 in 2007 versus 7.4 in 2014. This global stabilization results from two contradictory trends that only appears by examining trends, according to age groups. About a third increase for 25-29 group (from 5.9 to 8 ,p=0.06) and for 30-34 (from 9.9 to 12.4 c=0.80 p=0.01) less vaccinated. These increases are statistically significant cannot be due to hazard. This increased risk of cancer following vaccination was dramatically illustrated by the sad story of Sarah Tait, olympic rowing champion, at the 2012 London Olympics. This champion saw her life shattered in full glory : she suffered invasive cervical cancer a few years later, being vaccinated and died at age 33. Of course, we don’t know if vaccination was the direct cause of her cancer, but she has, statistically, a one in two chances of having suffered from a cancer linked to vaccination (to be part of the 113% increase of cancer observed after vaccination). In addition, we remark that cancer appears very early in this woman. and even less 31% for those aged 80 to 84 (from 14.5 to 10). Women aged between 20 and 25 years, vaccinated for more than 85% of them, when they were between 14 and 18 years old, have seen their cancer risk increase by 70% in 2 years (from 2.7 in 2012 to 4.6 per 100,000 in 2014 p = 0.0006) and those aged 25 to 30, ( aged between 18 and 23 at the time of the vaccination campaign) have seen their cancer risk increase by 100% between 2007 and 2015 (from 11 / 100,000 to 22 / 100,000 ). ( -13% for women aged 65 to 79 and -10% for those over 80 ), most likely because continuation of smear screening. 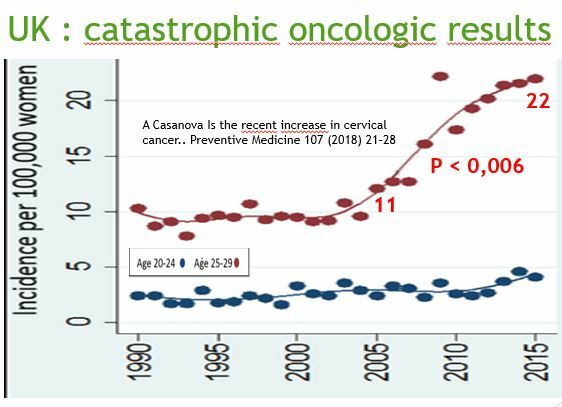 SAME PARADOXICAL PHENOMENON OF GARDASIL IN SWEDEN : THE RATE OF CANCER INCREASES IN THE VACCINATED AGE GROUPS . ALERT! 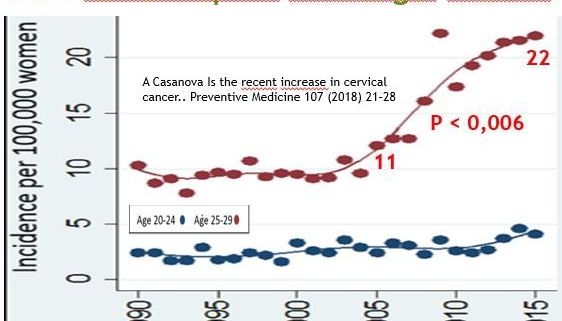 This increase is due -almost exclusively- to young women, which include all vaccinated, as evidenced by the sharp decline of the average age of onset of the cervix cancer from 48 years in 2002 -2006 to 45 years in 2012-2016. Between 2007 and 2015 , the incidence of invasive cervical cancer increased by 8% among women aged 20 to 29 (from 7.78 to 8.47). 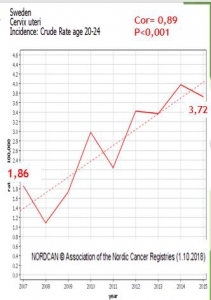 During the same period, a decrease in the incidence of invasive cancer was observed in older women, not involved in the vaccination program: -11% for women aged 55 to 64 (15.47 to 13.7), -16% for those aged 65 to 74 (17.7 to 14.71) and -29% for those aged 75 to 85 (18.39 to 13) . 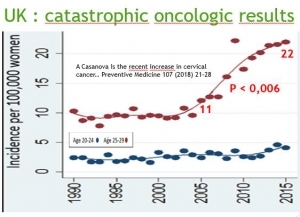 According to the Cancer Statistics Review 1975-2015, the standardized incidence of invasive cervical cancer remains stable(+0.1) since vaccination. The evolution of these countries, with high immunization coverage, can be compared to the trend observed in metropolitan France, where HPV vaccination coverage is very low (around 15%). France can be considered, for this reason, as a control country. In France the incidence of cervical cancer has steadily decreased from 15 in 1995 to 7.5 in 2007, 6.7 in 2012 and 6 in 2017, much lower than those of countries with high vaccine coverage. It is paradoxical and very worrying that these excellent French results, with low cervix cancer rate and low related mortality, could be jeopardized by an obligation considered in the short term by our policies, for some misinformed and other big pharma links. For women under 20, the crude number are to small to reach statistical significance, but the similar increases in all the studied countries constitutes a strong alarm signal. https://www.agoravox.fr/tribune-libre/article/gardasil-alerte-risque-immine…Gardasil, alert, imminent risk of mandatory vaccination against HPV unnecessary, and sometimes dangerous , for girls and boys. Autism requires thinking outside of the box… Ecstacy? Horray for this donor also!